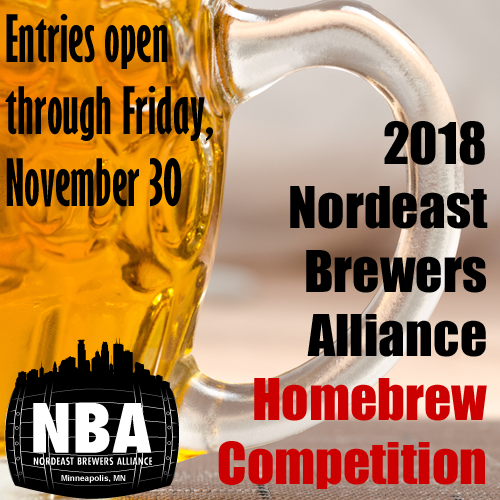 The 2018 Nordeast Brewers Alliance Homebrew Competition is open for entries through Friday, November 30. For those in Minnesota, you can drop off at Northern Brewer, Midwest Supplies, or Brew & Grow -- or check the registration page for mail-in entries. Judges, stewards, and volunteers are needed for Sunday, December 9 in Northeast Minneapolis. More info available at https://nordeasthbc.brewcompetition.com. Please feel free to contact nba.communication@gmail.com with any questions.